We are excited to present you our next tiny analysis about two emojis, which are slowly taking over the social media. 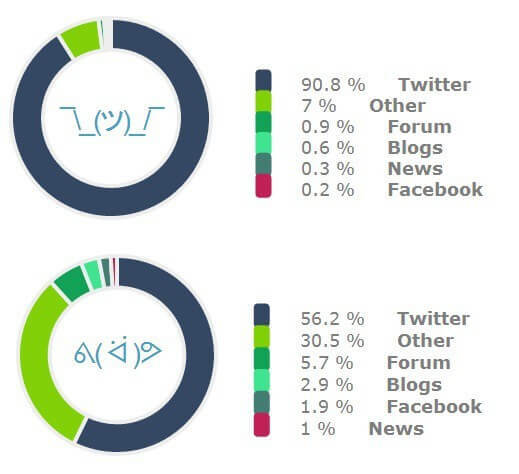 We pulled from the Internet mentions which included ¯_(ツ)_/¯ or ᕕ( ᐛ )ᕗ to see how social media users communicate with each other using these symbols. Inspiration of this entry was Mashable’s article that we’ve come across recently. As we mentioned in our previous article about new Snapchat functionality, people in social media decreasingly and less willingly apply written word in their comments. Instead they prefer images or video sharing. Or emojis which sometimes are worth a thousand words and require less effort to read and write it. Today we examined two different emojis. First one – ¯_(ツ)_/¯ – commonly known as smugshrug or simply shruggie spreads on Facebook and Twitter feeds expressing various emotions but rather with a negative tone. The second is definitely a positive one – ᕕ( ᐛ )ᕗ, which reflects great joy, happiness and excitement. We decided to extract from social media platforms more mentions which include those emojis and analyze them with a little help of our analyzing tool. Main sources Most popular source of mentions was Twitter. social media users enthusiastically perceive entries with emojis.